Billy and Mentor team up with a Native American boy, Johnny and his grandfather to stop the thieves, and preserve “the beauty of the land.” The thieves, however, nearly escape from a nearby airport…until Captain Marvel stops them. 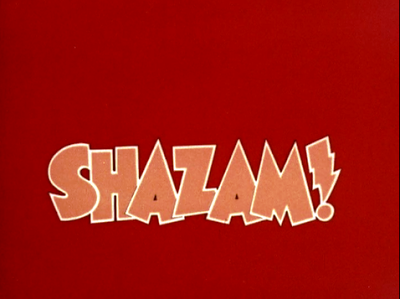 Like almost every episode of Shazam’s first season thus far, “The Treasure” features no interior locations, only exteriors. What makes “The Treasure” fun, however, is the nature of the location shooting. 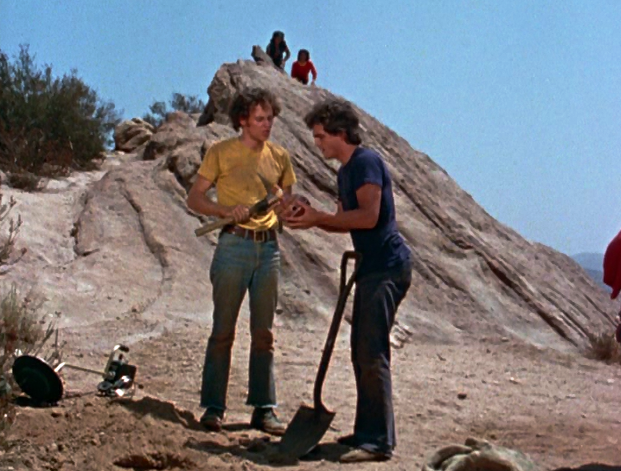 The episode is shot at the famous Vasquez Rocks, home of the Zanti Misfits (The Outer Limits), the Gorn (Star Trek), and other cult-TV series including The Invaders, Space: Above and Beyond, and Alias. The famous angled/pointed mountain rock can be seen in “The Treasure” but from a different angle than featured in most programs. Here, Mentor’s RV -- with the Captain Marvel lightning bolt emblazoned on the hood -- drives down a path right in front of that craggy outcropping. 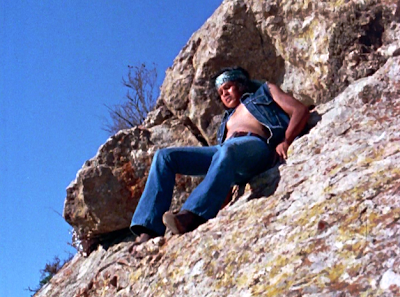 Otherwise, “The Treasure” is distinguished primarily by its more-accomplished than-usual final action scene. Here, Captain Marvel (Jackson Bostwick) chases down a fast-moving plane on the runway, grabs a rudder, and brings the craft to a dead stop. Through the use of fast-motion photography and a few other tricks, the super heroics actually come off looking rather impressive. 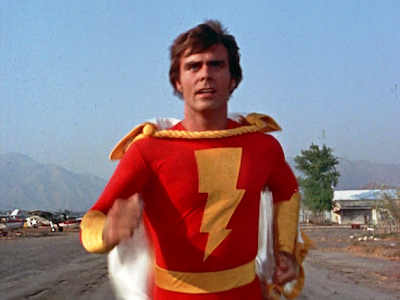 And for those cataloging such factors, “The Treasure” marks the second time in seven episodes (after “The Brothers”) in which Billy’s secret identity as Captain Marvel is learned by an outsider. In this case, it’s the trustworthy Grandfather who knows the truth. In terms of my retrospective here on the blog, I must confess that Shazam is monumentally uninteresting after seven episodes, and therefore difficult to commit to on a long term basis. The episodes are preachy, predictable and uninteresting. There’s not much variation in storytelling. 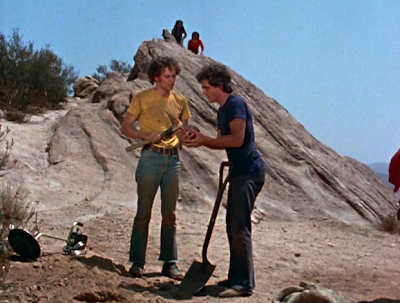 The Vasquez Rocks is a welcome location in any film or series. I am surprised that Ark II(1976-1977) never visited this location. So when you complete season one of Shazam which Saturday morning series will you be reviewing? 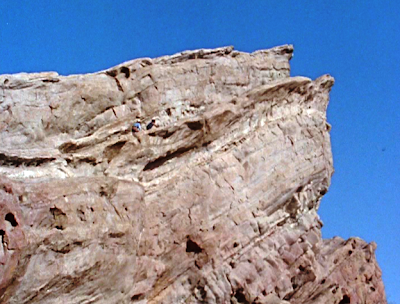 I am also surprised that the Ark II never went to Vasquez Rocks. Seems like it should have, right? Thank you for a great comment, my friend. John I think Star Trek: The Animated Series would be an excellent choice for Saturday mornings since on Sundays you are currently review Star Blazers. Two great '70s animated science-fiction series.